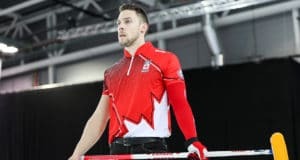 Hasselborg’s Stockholm team, which won the Olympic gold medal last month in Gangneung, South Korea, cruised to an 8-4 win over Germany’s Daniela Jentsch (1-6) on Wednesday morning at the North Bay Memorial Gardens. With the victory, Hasselborg, vice-skip Sara McManus, second Agnes Knochenhauer, lead Sofia Mabergs, alternate Jennie Wählin, team coach Maria Prytz and national coach Peja Lindholm improved to 8-0 and two full games clear of the field in the 13-team round-robin standings. Canada’s Jennifer Jones, who had a bye on Wednesday morning, also is unbeaten at 6-0. The Swedes opened with a second-end deuce against Germany, surrendered one in the third end, took control with two in the fourth end and a stolen deuce in the fifth. In other action on Wednesday morning, South Korea’s EunJung Kim stole a 9-8 victory over Jamie Sinclair of the United States (3-4) to improve to 6-1 and firmly in the race for a high seeding in the six-team playoffs that begin Saturday. The Koreans scored a 10th-end deuce to tie the game, and stole one in the 11th when Sinclair was heavy on her draw to the four-foot for the victory. In the other morning games, two-time world champ Binia Feltscher of Switzerland (3-4) rallied from a 4-1 deficit to beat Denmark’s Angelina Jensen (1-6) 7-5, and Scotland’s Hanna Fleming (2-6) stole three in the eighth end for a 10-7 win over Japan’s Tori Koana (3-4). Besides Canada, Russia’s Victoria Moiseeva (4-2), Anna Kubešková of the Czech Republic (4-3), China’s Yilun Jiang (3-4) and Italy’s Diana Gaspari (2-5) had byes on Wednesday morning. The 2018 Ford World Women’s Curling Championship continues with draws Wednesday at 2 p.m. and 7 p.m. (all times ET). 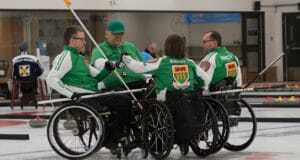 Previous: Curl4Canada gets underway Saturday at Leduc, Alta.